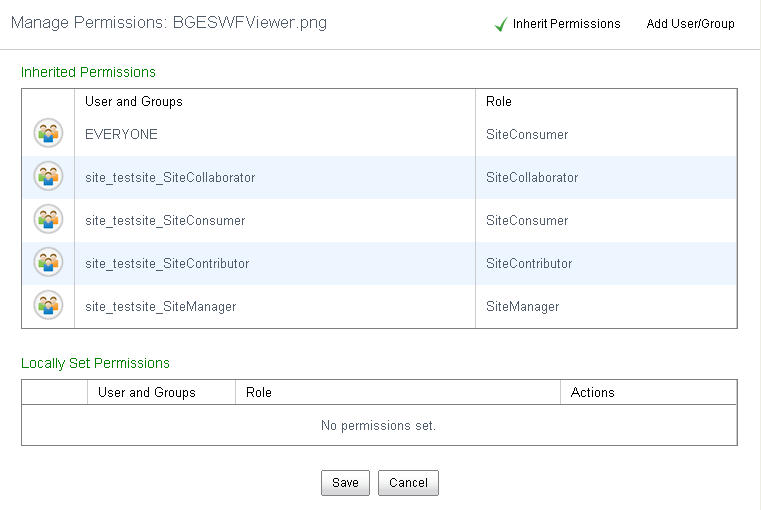 People are sometimes surprised to find that although the Alfresco repository is architected to have very granular permissions, permissions assignments via the Share UI are based on Site roles. 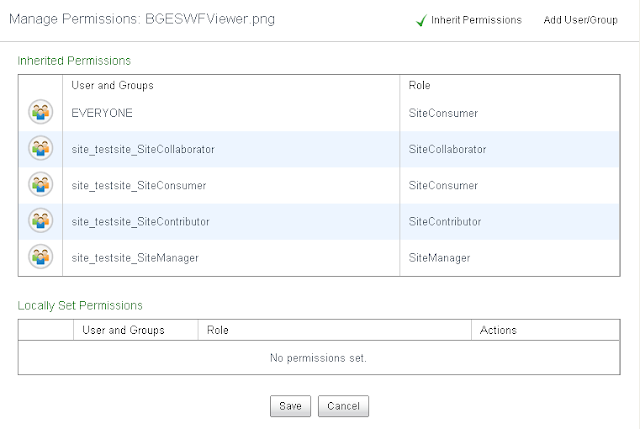 Within the Alfresco Share client, assignment of permissions at the object level is possible using the Manage Permissions action dialog: Here we can see that permissions are assigned to the standard Share site groups. There is no way using this dialog to specify permissions for an individual. The mix of using the same name, like 'Site Consumer' when referring to groups, privilege sets and roles also makes for some confusion on this dialog. If permissions on objects can be enforced only by role, how can one restrict the viewing of some of the documents in the repository to only one or a few individuals? It can be done from the Explorer client. And, interestingly, it can also be accessed in Alfresco Share when browsing the Alfresco Repository, a feature which has been made available in Share. When browsing the repository, a different page is displayed for setting permissions than the dialog we saw above which is used when browsing within a site Document Library. I'm not sure why Alfresco developers decided on this particular discrepancy in the design. So setting permissions at a much more granular level is available within Share out of the box, but its location is a bit problematic because it isn't obvious that it is available. To change the behavior of the Manage Permissions action to be the same as that available from the Share Repository button is not hard. To do that we need to modify three files. 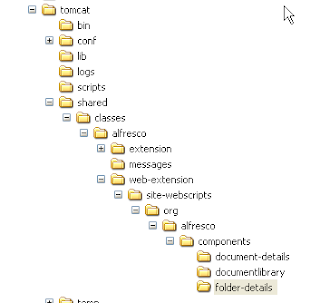 First we make folders in the tomcat/shared folder to hold the Share files that we will change. In the document-details folder, we copy over the file document-actions.get.config.xml. In the documentlibrary folder, we copy over the file documentlist.get.config.xml. In the folder-details folder, we copy over the file folder-actions.get.config.xml. and twice in the file documentlist.get.config.xml. After adding these files, we stop and start the server. After doing that, the Manage Permissions screen shows the following. Now we can log out as the site manager and log in as as Mary, a Site Collaborator. Mary should have no permission to see this document. Mary can navigate into the document library for the site and she does not see the document restricted to Susan. This seems to be a bug with this Alfresco dashlet to have allowed a restricted document's name to be seen by someone without permission. But, other than that, this seems to work pretty well. 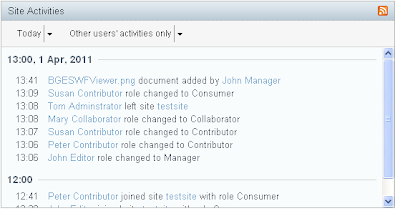 When logging in as Susan, in the Dashboard for the site, we see references to the document in both the "Recently Modified Document" dashlet and also the "Site Activities" dashlet. But this is as it should be since Susan has rights to see this document. 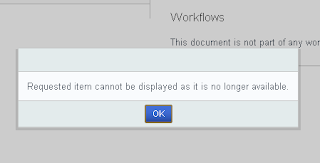 On navigation into the Document Library, Susan is able to successfully open the document. She can open the document details page. 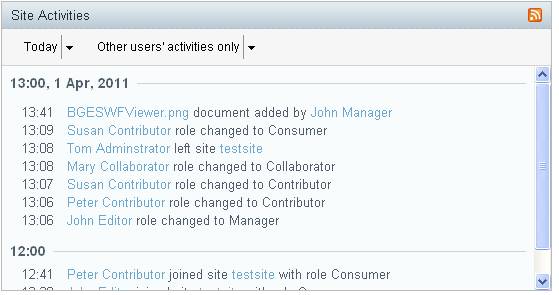 If you notice when we assigned permissions to Susan above, we gave her permission as "Site Collaborator". In that case, Susan is able to edit the metadata for it. To achieve the same thing in Alfresco 4.x is a lot simpler. Do not edit the files mentioned in this article. The *.get.config.xml files don't exist anymore. 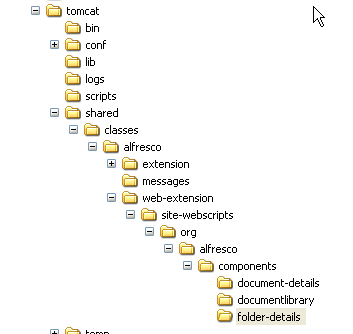 All of the Share actions are now defined in tomcat/webapps/share/web-inf/classes/alfresco/share-documentlibrary-config.xml in the Document Library Actions config section. Search for document-manage-site-permissions action id. This is the action you'll want to modify, BUT NOT IN THIS FILE. You'll want to override the action definition. IMPORTANT: Add 'replace' attribute to the config element in the custom file so that it looks like below. This will ensure an override. 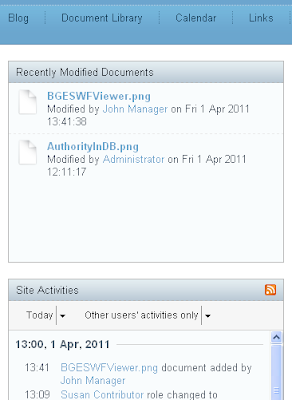 Now locate the document-manage-site-permissions action again in your custom file, and modify it as shown below. That's it. 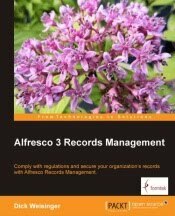 Now restart alfresco, log in as Mary and test.